You Get a Collar! You Get a Collar! Giveaways on the Farm…. In all those years of 4-H cow showmanship contests, I garnered white-participation ribbons and learned to appreciate 16th place. Now, decades later, the skills paid off…in goats. 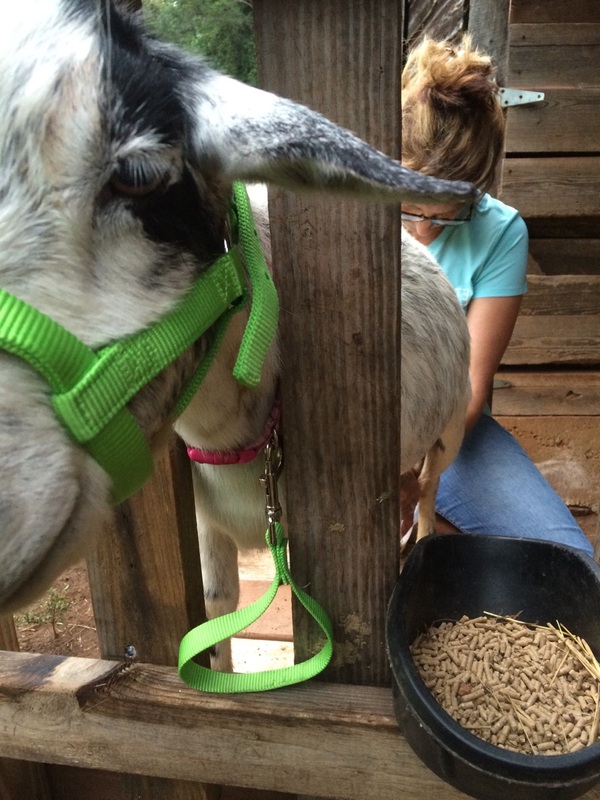 Catching goats is worse than herding cats. With their sharp horns and cheetah-like sprints, we quickly tired of grabbing horns and chasing them like a rogue version of a ninja warrior television show. Animal scientist, Temple Grandin calls goat horns the “no-fly zone” for human touch. There had to be a better way. Faith Hill weighs at least 45 pounds and the other night, I picked her up, and she smacked her horn into my jaw. I thought I was going to lose a tooth. That night, I watched a video by K-N-S Farm of the lady using a dog harness for her blind goat, and I finally saw the light. A quick trip to Tractor Supply after work the next day, and I scored a goat halter, lead, and a medium dog collar. We cornered Faith Hill in the barn, and I added the pink collar. She allowed me to walk and coax her to the milking stanchion. Once we had her head secured, I added the halter. She stood for milking and when we released her head, I held the lead, walked her down the stanchion, and around the pasture. This small success involved an ancient trick of bribing the her with a bowl of feed and a treat. My technique works now, but all those years ago, judges in the fairground exhibition ring found my tactic to be completely wrong. As a youngster, I watched in frustration as all the other 4-Hers easily maneuvered their cows into straight lines like dog handlers at Westminster; my stubborn calf wanted to find the nearest bucket of feed…in the stand with the spectators. Mortified, the judges handed me a white ribbon, and I think one may have muttered something about not coming back. That calf, known by her number ,”583″, grew up to be a milking cow who was always first in line at milking times, and she didn’t mind being handled by us humans. I certainly would have never imagined that all those failed attempts at cow showmanship would one day be a shining moment in our milking time with goats. Photos courtesy of Kelly Reep. “What is that smell?” I sniffed the air, then my arms and hands. “It’s me! 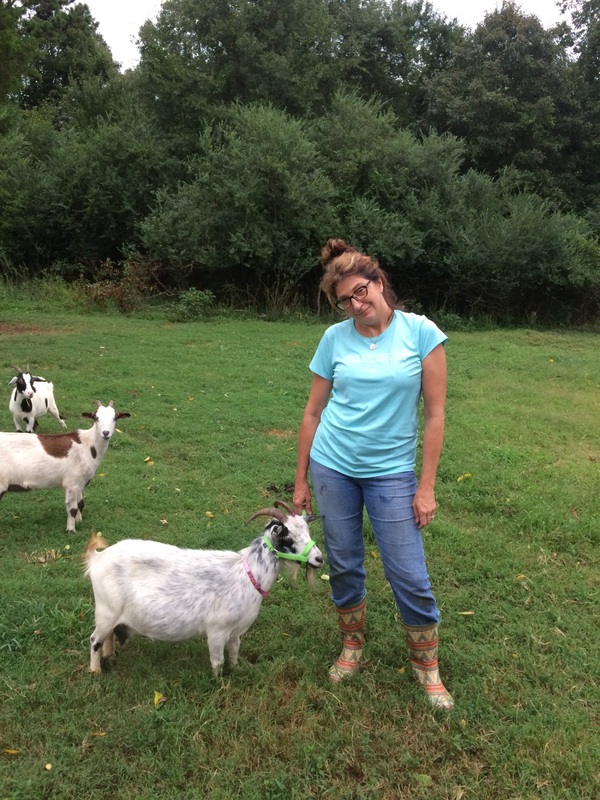 I smell like a goat!” I grimaced at my rain-soaked shirt drenched in sweat, dirt, feces and goat milk. It was July 4th, and the humidity was rising to fierce levels. It had been over 20 years since I smelled that combination. It’s a smell that hid in the recesses of my mind once I moved away from the dairy farm as a young adult. Now, with a small herd of goats, the smell engulfed me. My brother Kelly and I spent the morning walking the fence line, cutting tree limbs off the fences that had fallen during the previous night’s storm. 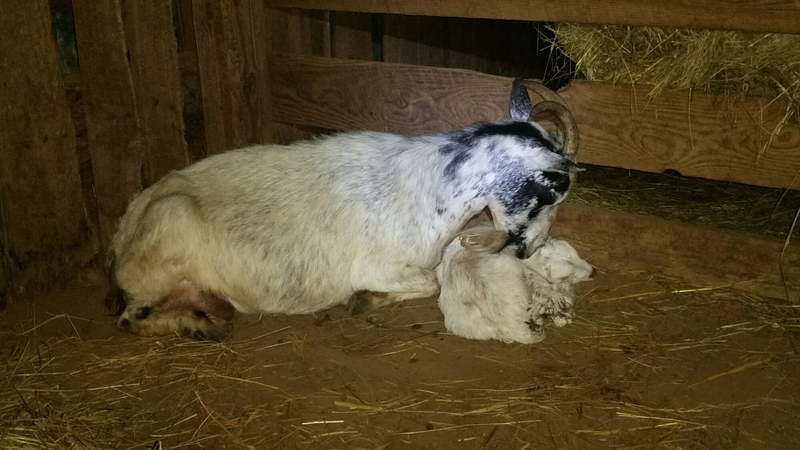 My goat named Faith Hill had just given birth to a buckling the previous week, and he was only nursing on one side. I muttered, “How do I know she’s finished?” Kelly replied, “You’ll figure it out.” Sure enough, a few minutes later, the goat’s teat and side of her udder felt flaccid and withered. She was done. 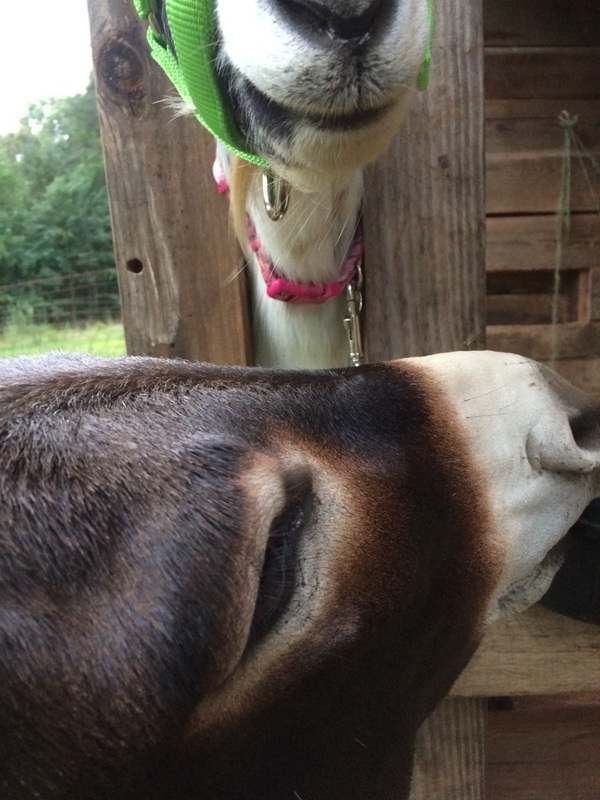 A few weeks later, my friend Joci came to visit the goats, and I realized that Faith’s udder was once again filled, because the buckling was not nursing from both sides. I looked at her and said, “Here, hold my goat.” I grabbed the nanny, and together we lifted her to the crate. 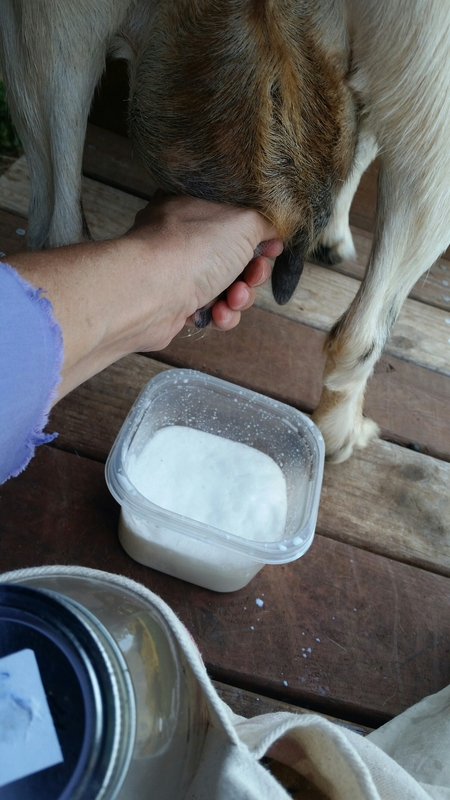 I repeated the process of milking that smelly gray and white horned animal. This time, she patiently stood while this stranger held her horns. With her back leg, she scratched my wrist and her own udder… which required a quick spray of Blue-Kote… the same magical spray that I’ve used on myself! Finally, we convinced him to go outside and he did hold the goat, for about 30 seconds. 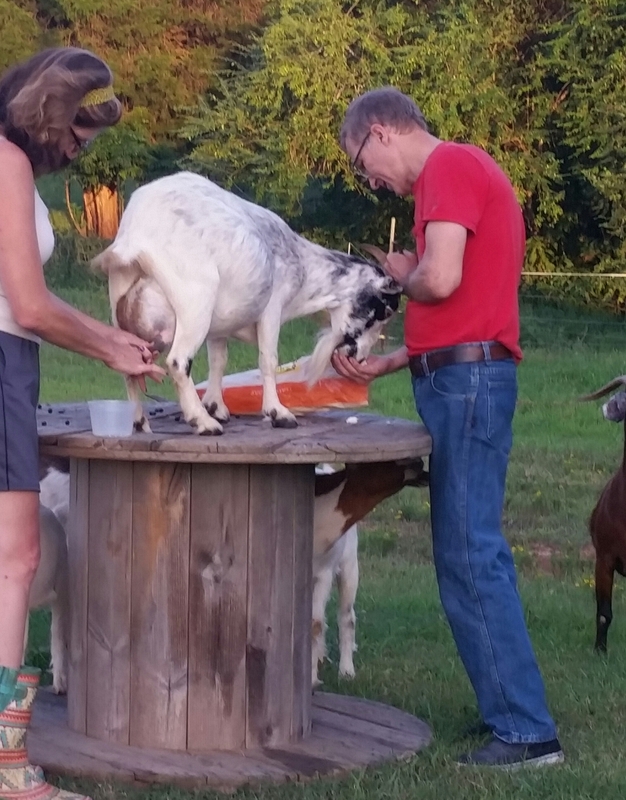 Then, Lisa took over and we laughed as 3 goats tried to eat snacks and I milked out another 1/2 quart of milk. Now, it’s September, and Jim just finished the goat stanchion last week. It’s a daily thing to milk the goat now. 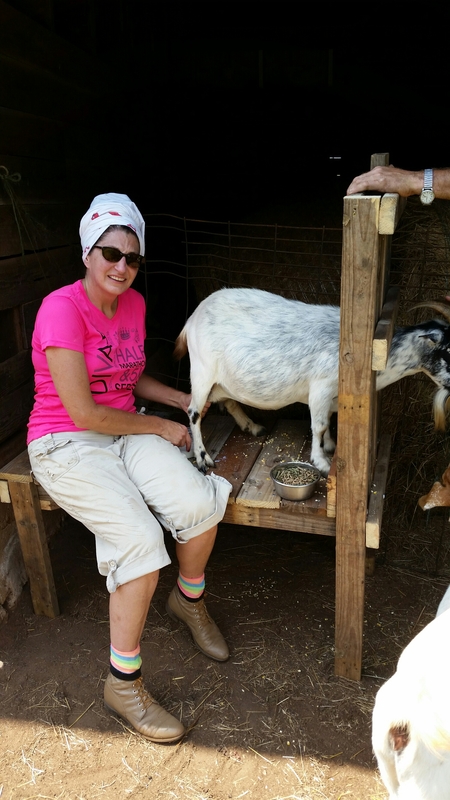 Stay tuned for more of the goat milking adventures! Photos courtesy of Kelly Reep and Jim Morgan. “Which two are ours?” I asked. “All 5 of them.” Sue replied. Jim walked out of the house and into the driveway where Sue, a kind-hearted lady, stood in front of her 1980s model van filled with five cat carriers, and five scared hissing feral cats peered at us. 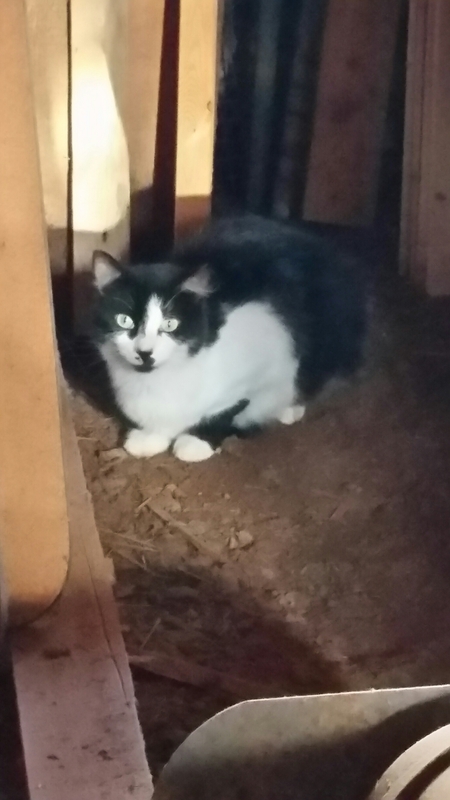 Jim said, “ok, we’ll see.” Sue drove to the barn to set-up these hissing cats in the tack room as I stood outside the barn in shock. We agree to take two…and we were looking at five. Each day, for two weeks, Sue stopped by and fed the hissing, growling felines. They hated me. On the 14th day, Jim and Sue opened the cages, and the cats ran into the woods. At night, I saw 5 pairs of eyes in the woods, watching me. Then I only saw 4…and three…until finally, a year later, Soot and Tink are the only remaining feral cats who will stay in the barn, catch mice and wait for feeding time. Wu-Ting tried to drive a firetruck and Tortuga lost a fight with a coyote. 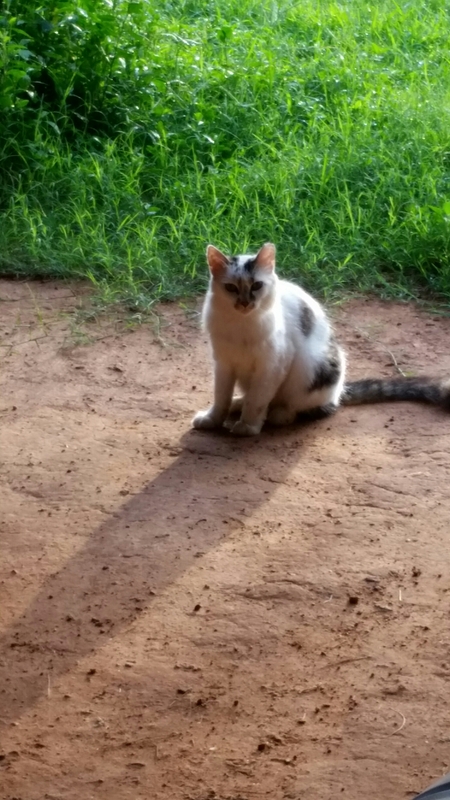 Mama-cat appears once a month, but after a year, we have two barn cats. And Mia isn’t happy. These are typical conversations at the office for me, but they must sound completely foreign to those who don’t know me. In fact, my doctor even said that it is simply odd to see me in person as a patient where I’m dressed professionally, but my Facebook posts center around life on the farm. Like the children’s song, “one of these things is not like the other…” I am often the anomaly of the group. That’s typical for me. Now, holding a basket of 12 eggs, I say to my 21 laying hens, “ladies, several of you have slacked off production. 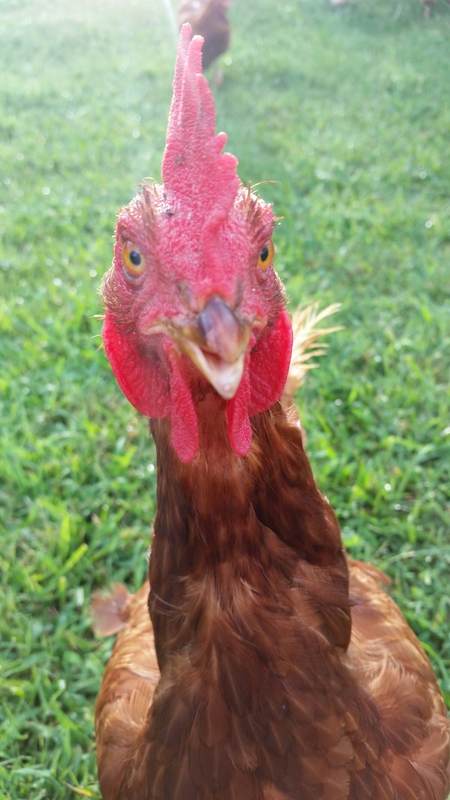 Please restart your services or we will be forced to rehome and replace you…with the exception of Henny-Penny.” That golden comet is probably 4 years old and lays a double -yolk egg once a month; but she’s friendly and she’s special.